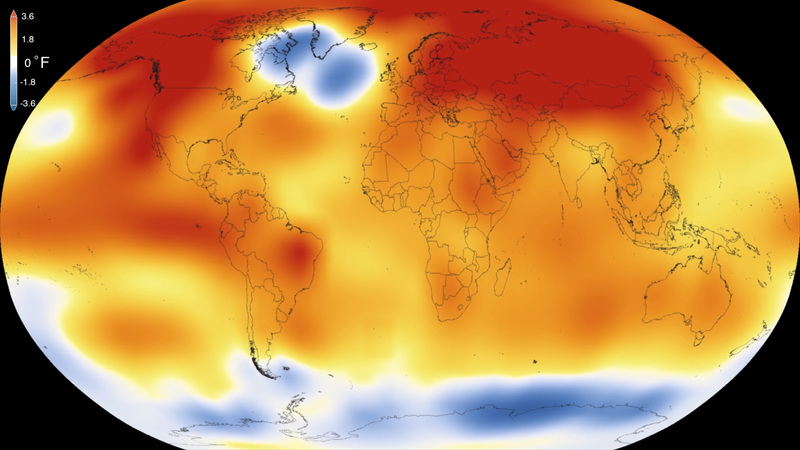 AGU reports that NASA and NOAA independently assessed that the planet’s average surface temperature jumped to a new high in 2015, except for a cool spot in the North Atlantic. Based on about 6300 stations, ships and buoys, both agencies found the average global temperature had increased compared to 2014 – which had also been a record year. NASA found the average was 0.87°C higher than the average temperature over 1951 – 1980, where NOAA found a 0.90°C increase compared to the average over 1901 – 2000. The below image, courtesy of the Scientific Visualization Studio at Goddard Space Flight Center, shows the 2015 change from the longterm average temperature, with hottest areas on Earth in red and the coldest in blue. Compliments to Cody Sullivan, AGU Intern, for the excellent article in EOS this past week!